Please scroll down the page where you will discover a variety of videos from some of our recent events. Each video features a marquee with it's own unique styling and set up. We built this beautiful wedding marquee over a private lake to provide the perfect setting for the happy couple’s reception party. We built a bar and chill out area in a completely clear marquee, with a bridge leading across the water to the main reception and dining area. The main marquee featured clear gable ends and glass sliding doors and windows. No expense was spared and no corners cut – the lake was drained in order for us to build the marquee, before being refilled for the big day! This beautiful Winter Marquee was created for a birthday party in mid December. Featuring carpeted boarded flooring, glass doors and wall panels, clear roof panels with white sails, a mirrored dance floor and a mirrored bar. We think you’ll agree, the result was stunning! This wedding marquee was built on raised, carpeted boarded flooring, using a scaffolding system to raise the level of the ground at one end to provide a completely level marquee. The marquee featured two separate areas – a completely clear marquee with glass window walls and clear paneled roof and gable ends and clear ‘Ghost’ chairs for the ceremony and a flat ivory lined marquee for the reception that followed. This photographic and video show-reel really brings what we do to life! Sometimes it can be hard to imagine just what your Party, Wedding or Event might be like. Set to an uplifting, upbeat dance track our show-reel should give you a flavour for just a few of the incredible events that we have been involved with over the last few years. A variety of marquee styles and designs, light shows and design features are on show, we don’t just put up a tent, we create a venue for your own unique, special and often spectacular event! Many thanks to all of our incredible supplier partners whose hard work is also featured throughout the video – we couldn’t do any of it without you. 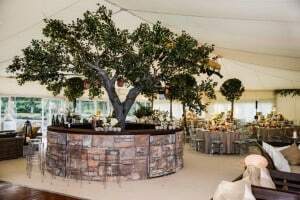 Working with the functions team at RHS Garden, Wisley we created a Wedding showcase marquee and invited brides-to-be, their other halves, friends and family to see for themselves how their own wedding reception might look. The RHS were able to showcase their beautiful grounds and marquee venue whilst a variety of other suppliers also showcased their services to create a spectacular marquee wedding reception for our guests to experience. Read more about the showcase here. This time lapse footage demonstrates how we used a scaffold system and raised boarded flooring to create a level surface for two joined marquees in a sloping garden to produce a stunning venue with a clear roof and gable ends for our clients wedding. We supplied this Traditional Pole Marquee for the West End Flower Show in Esher. 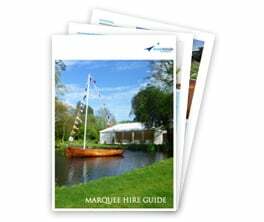 Our traditional pole marquees are available between April and the end of October. They provide a rustic, garden party look and feel with a traditional edge. The video uses time lapse to show the marquee going up as well of some footage of the marquee on the day of the event. We provided this marquee for The Mane Chance Sanctuary Charity fundraising event whose patron is actress Jenny Seagrove. Featuring a Chinese hat pagoda entrance with a glass entrance door and with burgandy pleated lining throughout. We were proud to provide this beautiful marquee for the wedding reception of Emily and Chris Jones. Emily, from one of our recommended catering companies Two Many Cooks, wanted to create a special venue for her guests and, having worked with us many times in the past, knew she could trust us to deliver her vision. Working with our friends from At Home Catering we created this spectacular marquee by building a platform over our clients patio and swimming pool areas; we also built out across their sloping rear garden to create a level surface. The result was spectacular – we think you will agree! Though it wasn’t finished when our foreman took this short video on his mobile phone, we wanted to show you the fabulous results that can be achieved with a simple marquee set up and a little creativity! Working with Backdrop Events we used a 15m x 6m frame tent for the main marquee, attached to a 12m x 6m marquee for the dance area. The set up featured black velvet lining throughout, red drapes, a black pealight dancefloor and a starcloth ceiling over the dance area. I just wanted to say thank you for the efforts on the weekend for our event in Cobham. The marquee looked great and as always a great level of service from the boys. Also a big thank you for sorting the extra chairs and tables last minute.